Santa Ana Wheel can re-chrome and chrome wheels for the first time. If you have slightly damaged or severely damaged chromes wheels with curb rashes, corrosion, or peeling, we can make any tire look like new! Customers can choose between regular chrome plating and PVD chrome plating. 1. 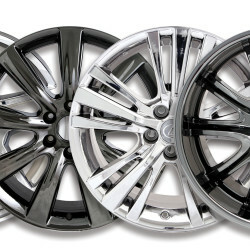 Traditional Chrome: is the process of putting a thin layer of chromium on an aluminum wheel. This offers an extensively mirrored and shiny look and feel that no other plating or coating can match. It turns a flat color like silver to a bright mirrored finish. The main benefit of chrome plating is the wheels become highly resistant to corrosion and rust. This makes them able to withstand harsh weather conditions. The chrome plating also makes the wheels much harder and durable than steel wheels or aluminum alloy. Pictured on the right. 2. Physical Vapor Deposition (PVD). It was originally designed for the aerospace industry but has become popular in the automotive industry due to its benefits. PVD chrome is highly durable and it outlasts the life of regular chrome plating. 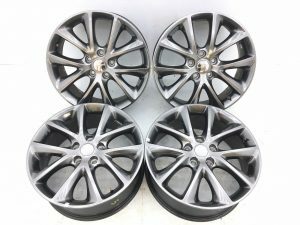 If damaged, PVD chrome wheels can be easily and inexpensively redone. PVD chrome is 80% lighter than than traditional chrome. It is also 100% environmentally friendly, because no hazardous materials are used and produces no hazardous waste. PVD chrome is offered in chrome silver, light silver and black finish. Pictured on the left. Q: How is chrome different than painting wheels? A: Chrome plating is the process of electroplating the material chromium onto a metal object. It takes bout 7-9 business days to complete and the result is a mirrored finish.